I am lacking a bit behind with my updates and I am terribly sorry for that, so here we go again! After my layover day Atlanta it was time to get back to work! Well, I didn’t have to do that much to be honest. When I woke up it was yet another sunny day in Georgia so I went out looking for food. I found this modern Mexican restaurant called Alma Cocina right on Peachtree Street and although their menu was small (good sign) all of it sounded delicious. So in I went and had a great grilled salad with chips and salsa. My cucumber-ginger drink was strong, but worked really well with the food. A great way to start the day! About 1 pm we were picked up for our dead-head flight to Chicago. “Dead-heading” is sometimes called “proceeding” on other airlines and basically means you are flying as a passenger from one place to the other in order to take over a flight from a different airport. It does not happen that often on the passenger flights, but for us cargo skippers it is normal business. Many destinations are only served once or twice a week and it would be very inefficient to keep crews sitting and waiting in once city for three or four days. 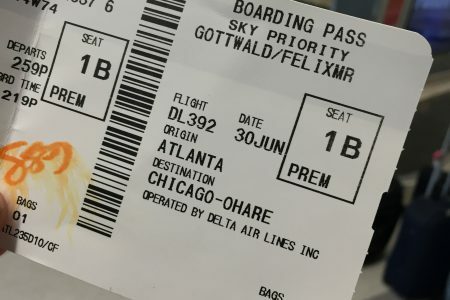 Today’s flight was routed from Atlanta to Chicago. Our flight Delta 392 from Atlanta to Chicago O’Hare was operated by a MD-88, registered N926DL. It was delivered to Delta in 1988 and has been with the airline ever since. There are still more than 100 in operation with Delta, as well as an additonal 65 MD-90s! Given the fact that there are hardly any left in Europe or Asia, this is quite astonishing. The cabin looked modern, but the cockpit already had a “used look”. Nevertheless Microsoft Surface EFBs are being used by the pilots in order to reduce the usage paper charts. Contrary to Lufthansa and many others that use Lido as chart provider, Delta still sticks to Jeppessen. After a short chat with the captain it was time for me to sit down and buckle up in the cabin. I was in seat 1B and could stretch my legs, but unfortunately did not have a view outside. My seat neighbour, like everyone else, kept the window shades shut the whole time. I felt like in an U-boat, moving through time and space without any orientation or knowledge of the outside world. Flight attendants encouraged passengers to keep the shades closed during taxi in order to keep the aircraft from heating up – sounds like a cheap way to save on air-condition to me… But everybody followed their order lemming-like and without any hesitation. I for one would rather look outside. We are being picked from ORD in a very nice car! I am back at one of my favourite cities in the United States! There is always that vibe that I have been missing so much in Atlanta. As it was already evening and we were getting tired, we decided to head for a bar that had billiards. A burger with onion rings and beating my captain at the billiard table a couple of times let to a great evening and I was in bed even well before midnight. There is real work to be done tomorrow, so I rather have a good long night of sleep!